Strawberry Yogurt Torte | FoodGaZm.. 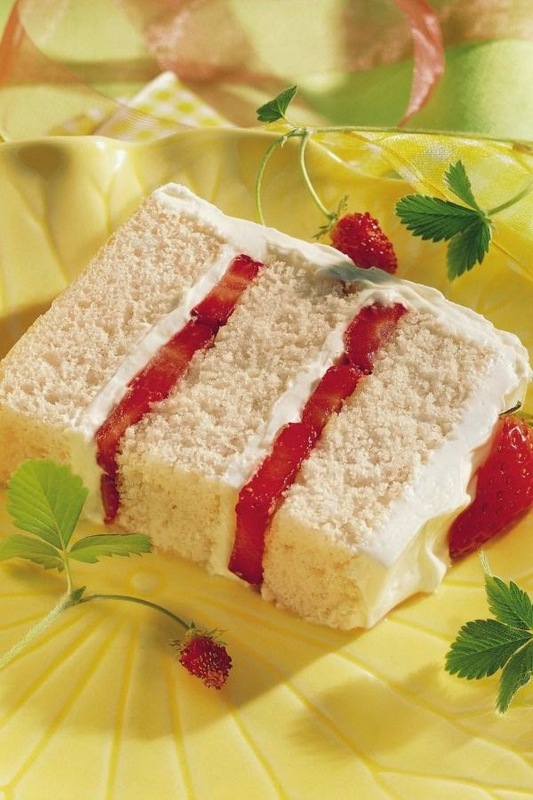 Sliced fresh strawberries are sandwiched between cake layers and frosting to make this dessert a winner! Heat oven to 350°F (325°F for dark or nonstick pan). Grease and flour 15x10x1-inch pan, or spray with baking spray with flour. In large bowl, beat cake ingredients with electric mixer on low speed 30 seconds, then on medium speed 2 minutes. Pour into pan. Bake 21 to 27 minutes or until toothpick inserted in center comes out clean. Cool 10 minutes; remove from pan to cooling rack. Cool completely, about 1 hour. Cut cake crosswise into thirds. Place one-third on flat serving plate; spread with 1/2 cup of the frosting. Arrange half of the sliced strawberries on frosting. Repeat with another third of cake, 1/2 cup of the frosting and remaining strawberries. Top with remaining third of cake. Frost sides of torte with thin coat of frosting to seal in crumbs, then frost sides and top. Cover loosely and refrigerate at least 2 hours until chilled. Before serving, garnish with berries and mint leaves. Cut into 12 slices; cut each slice in half. Store loosely covered in refrigerator. Trim the cake layers to make the edges even, if necessary. So the cake will be easier to frost, freeze the cake thirds uncovered for about 1 hour. Fluffy white or cream cheese frosting can be used instead of the vanilla. Tote this cake easily when you bake it in a 13x9x2-inch pan. Grease the bottom of the pan, make the cake as directed and bake 28 to 34 minutes. Spread 1 container of frosting over the completely cooled cake, and top with 2 cups (1 pint) of sliced strawberries. Show off a cake on a pedestal when you’ve baked it in 2 layers. Grease and flour two 8-inch or 9-inch round pans, make the cake as directed and bake the layers for 25 to 32 minutes. Fill the layers with some of the frosting and sliced strawberries. Then frost the side and top of the cake, and top with the rest of the strawberries.